Cartographic challenges in a globalized world. The passage of time and the ways in which it is represented have been arousing growing interest in the geographical sciences. The reason is simple. In an ever more dynamic society, witnessing a considerable acceleration of historical phenomena and their spatial consequences, the study of processes acquires more importance than that of the single moments they comprise. This consideration is valid for all geographical studies, but the map is where the ability of geography to offer meaningful representations of reality is ultimately measured. The map, however, is an instrument that, in its traditional Cartesian conception, has difficulty depicting dynamic phenomena, since it is, by definition, a “snapshot”, a representation of a given instant. Henri Cartier-Bresson’s aphorism, originally used in reference to the photograph, may be applied here, too: “where the instant meets geometry”1. To the physicist and the natural philosopher time is increasingly understood as a conjoint entity with space, fused together in the space-time manifold, i.e. process. Geographers have been late in exploring this emphasis. The task of coping with spatial pattern has in most cases precluded true concern with process, or vice versa. We have long remained constrained by the old high school schema which saw history and geography as two orthogonal planes […]. Many usages of space in geography are inspired by a static absolutist viewpoint. Forer’s words, although written many years ago, remain very relevant. This state of affairs carries significant consequences for mapping, which, at least in its official forms, continues to ignore the temporal dimension and, in fact, stubbornly refuses to portray movement in any way, preserving its fundamentally static nature. Such a conservative approach is surprising in the context of a historical period such as ours, characterized by continuous technological progress, which could be expected to stimulate theoretical and conceptual innovation. Instead, automated cartography, despite the power of the technical tools at its disposal, continues to represent time using graphic solutions inherited from the past, and the experiments in visualization techniques remain, despite appearances, rare and of relatively little significance. Even the debate regarding the Geographical Information Systems, albeit lively, focuses mainly on the management of spatio-temporal information and not on its visualization. Such persistence of old methods induced me to engage in a more in-depth study of the entire range of spatio-temporal representation techniques developed in the past, so as to facilitate a more effective application as well as possible improvement of such techniques. This is, thus, an exploration of solutions that are “non-conventional” in the sense that they do not follow the empirical-rationalist approach and are not based on Euclidean geometry. It is a historical reconstruction — not exhaustive, to be sure, but sufficiently broad — of the different methods used to portray movement throughout the history of Western cartography and of the practical and intellectual needs that such solutions have attempted to address. I shall also analyze the scientific paradigms that have favoured and stimulated innovation in this field. Spatio-temporal representations and scientific paradigms: a historical review. The perception of space varies from one society to another. The mystical spatiality of the Middle Ages is thus as respectable as the mathematical spatiality of the Renaissance or the fluid spatiality of the Postmodern Era. Not only can we not, therefore, speak of the science of the representation of space in any absolute sense, but we must also admit, based on Thomas Kuhn’s (1962) observation regarding the cyclic nature of scientific enquiry, that the popularity of a theory is temporary: it should not be attributed to its alleged intrinsic superiority, but rather to the degree to which it is in line with the scientific paradigm of its time. The geographical map too, like any other intellectual product, is inspired and affected by the dominant scientific paradigm on which its constructive rules are based, that is, the prevailing set of rules, models and procedures used in a society to produce and transmit knowledge. 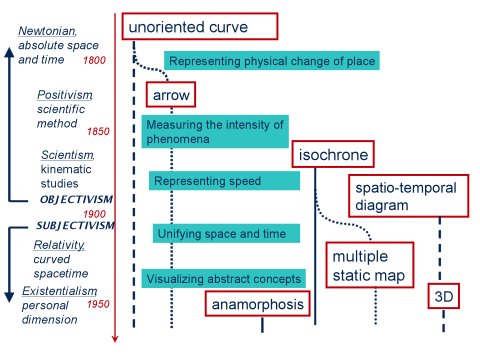 As noted, this paper will trace the evolution of the graphic solutions used to represent, simultaneously, both the temporal and spatial dimensions, in light of the scientific paradigms that have dominated Western thought in the past two centuries. The geographical map begins to display distinct geometric characteristics as early as the 16th century, but it is not before the 18th century that the set of rules on which it rests becomes explicitly Euclidean. The Euclidean map gains absolute supremacy over all other forms of representation of space in the course of the 19th century, when, thanks to Descartes’ teachings and the spread of the modern scientific method, the geographical sciences completely adhere to scientific rationalism and topographic spatial models. As for the temporal dimension in cartography, the idea of combining space and time in a single representation was, for a long time, considered an unacceptable jumble, as though foreign elements could contaminate the “snapshot” of the land. Cartographers thus refused to include temporal information within maps, relegating it to an external space outside the map’s frame. Only later does the element of time enter the map itself. First, in the text filling the map (Map n°1), and then, increasingly integrated into the cartographic image itself. It remains, however, a minimal, barely noticeable intrusion, clearly reflecting a wish to refrain from damaging the rigorously geometric and exclusively spatial nature of the map. Thus, the only notion of time that geometric cartography accepted was elaborated on the basis of Newton’s conceptions, and expressed graphically either by way of unoriented curves, or the older and more intuitive symbol for indicating direction: the arrow. The first use of arrows in cartography is found in a map drawn by Edmund Halley in 1686 (Map n°2). In this case, the arrows were used to connote atmospheric currents. It took a long time before the arrow appeared prominently on a map. In 1769, Timothy Folger and Benjamin Franklin used it to indicate the direction of the Gulf Stream (Map n°3). Despite the considerable value of these two innovative maps that introduced a symbol into cartography which remains very popular to this day, it should be noted that in both cases the arrows indicate the direction of movement but not the time factor. No information is given regarding the velocity of movement. By and large, almost until the end of the 19th century, time in geographical maps was expressed, in a rather vague and generic fashion, using symbols: the unoriented curve and the arrow, symbols that perfectly convey a Newtonian perception of time: absolute, sequential and uniform. Map n°1. Le Sage, A., “Afrika, Historisch und Geographisch vom Jahr 1828” in: Historisch-Genealogisch-Geographischer Atlas, Karlsruhe, Bei Creuzbauer und Nöldeke, 1821. Map n°2. Halley E., Map of the trade winds and monsoons, 1686, in: “An Historical Account of the Trade Winds, and Monsoons, Observable in the Seas and Near the Tropicks; With an Attempt to Assign the Phisical Cause of Said Winds”, in Philosophical Transactions, 1686, 183, pp. 153-168. Map n°3. Folger Timothy-Franklin Benjamin, A Chart of the Gulf Stream, 1769. While Newtonian mechanics saw motion exclusively as a change of position or physical change of place, positivism interpreted it as a change of state or intensity. The main objective of every scientific study thus became that of measuring the intensity of phenomena. The famous cartogram shown below (Map n°4), drawn by Charles Joseph Minard, is characteristic of this new scientific approach as applied to cartography. Minard’s contribution to statistical graphics is considered so crucial that Tufte (1983, p. 40) characterized the cartogram in question as “probably the best statistical graph ever drawn”. It depicts Napoleon’s Russian campaign in 1812. The broken line shows the path followed by the troops from the Russian-Polish border to Moscow and back, while its width is proportional to the number of surviving soldiers – gradually decreasing as they approach Moscow, and greatly reduced on the return journey. Time is indicated through a series of dates at the bottom of the graph, which also serve the purpose of pointing out the main cause of the defeat: the low temperatures encountered along the way. The presence of quantitative data and of the cause of the phenomenon render this cartogram an excellent example of the scientific spirit of positivism, oriented towards the cause-and-effect rationale. Nevertheless, this historical period saw no significant innovation in the graphic solutions used to represent, simultaneously, both space and time. The arrow and the unoriented curve remain the only two symbols used for this purpose. It should be noted, however, that both the production and the dissemination of scientific representations benefited from technical innovations in the field of printing such as widespread use of lithographic colour printing. A map in which each colour corresponds to a different period in the evolution of a phenomenon is able to convey the development of the spatial array of that phenomenon in time. The use of colour was a significant event in the history of mapping since, as we shall see, it inspired the advent of isochrones. Map n°4. Minard C.J., « Carte Figurative des pertes successives en hommes de l’Armée Française dans la campagne de Russie 1812-1813 », in : Tableaux Graphiques et Cartes Figuratives de M.Minard, 1869. Between the 19th and the 20th centuries, constant technological developments in the field of transportation — from the bicycle to the airplane, through the train, the tram and the automobile —brought about a rapid and irreversible process of spatio-temporal compression in people’s perceptions. This process was further intensified by the astounding innovations in the field of electronic communications, including, between the beginning and the end of the 19th century, the introduction of the telegraph and, later, the telephone and the radio. These innovations, clearly redefined the way in which a substantial portion of society perceived space: “The mountains, the lakes, the ocean were no longer as far away as formerly; the bicycle, the automobile, and the electric trains had shortened distances and had given the world a new spaciousness” (Zweig, 1964, p. 193). New graphic solutions developed rapidly as a result, to satisfy the increasing need to provide the reader with information regarding the speed of phenomena. The need arose, to go beyond the representation of the mere direction of a flux, to add information regarding the time it takes for it to develop. In 1847, Matthew Fontaine Maury drew a map of marine currents, the direction of which was shown by way of arrows, and the velocity using adjacent labels. In 1855, Fontaine Maury devised a brilliant new method for providing information on speed, with the space between symbols representing the unit of time (Map no.5. Here, each “vessel” symbol represents one day of passage). Map n°5. Maury M.F., “Winds and maritime routes of the world”, in: The Physical Geography of the Sea, New York, Harper & Brothers, 1855. But the revolution that had occurred in the perception of time and space was bound to inspire equally revolutionary spatial representations, also thanks to the evolution of certain fields of study, some of which, like kinematics, were completely new. Etienne Jules Marey, a pioneer in the field of kinematics who applied photography to the study of motion, is the author of the famous representation shown in chart 62. The chart in question is a graphic train schedule, where the spatial dimension is given on the y-axis (Paris-Lyon stretch) and the time on the x-axis (hours of the day). Every broken line represents a train travelling from Paris to Lyon (from top left to bottom right) or vice versa (from bottom left to top right). The slope of the line shows the speed of the train. This was a valuable tool for the management of the train service, as it made it possible to provide a complete and exact representation of the train traffic along the stretch in question, at a glance. The relevance of this space-time diagram to the study of spatial representations stems from the fact that the practice of stylizing space to the point of reducing it to a mere line (as in the diagram in question) had already been in use for a long time in cartography, in the so-called strip maps (MacEachren, 1986, pp. 7-25) used in the communications sector. Marey’s diagram may thus be considered an extension of the classical strip map to include the temporal as well as the spatial dimension. Map n°6. Marey É.J., « Graphique de la marche des trains sur un chemin de fer », in: La Méthode Graphique, Paris, Masson, 1885, p. 20. Spatio-temporal diagrams have also been applied to fields other than transport. In 1894, Stanley Lane-Poole drew a time chart of Muslim dynasties, in which space (the extension of the spread of Islam) was represented on the x-axis and time (in centuries) on the y-axis. Another sign of the intellectual ferment at the close of the 19th century, triggered by the new perception of space and time, is the advent of the isochrones, proposed for the first time by Sir Francis Galton in 18813. Map n°7. Galton F., “On the construction of isochronic passage charts”, in: Proceedings of the Royal Geographical Society, n°3, 1881, p. 704. As Galton himself mentions at the beginning of his article (1881, p. 657), his inspiration in developing this new mode of spatio-temporal representation came from his interest in meteorology. Working on isolines such as isobars and isotherms, it occurred to him that the same principle could also be applied to the graphic representation of time, using lines to join places having the same intensity of the phenomenon being mapped. In Galton’s first isochrone map, colour played a central role in allowing the instantaneous perception of the differentiated areas. The method was subsequently perfected and its use extended giving rise to a truly innovative mode of representation, in which colour was no longer necessary. Map no. 8 is an excellent example of a successful application of this new method, the use of which was to spread rapidly in subsequent years. The map shows how the improvement of communications produces an imaginary alteration of geographical space, whereby Corsica seems to grow increasingly closer to Marseille between the years 1830 and 1900. The image is very efficacious in transmitting its message, despite a clear logical error – the alteration of space should not apply equally to all parts of the island; in a map reflecting the differential “shortening of distances” the shape of the element “Corsica” would change from one stage to the other as a result. Map n°8. Album de Statistique Graphique de 1906, Imprimerie Nationale, 1906 (reproduced in : Bruhnes J.-Vallaux C., La Géographie et l’histoire, Paris, Alcan, 1921, p. 11). A more appropriate graphic solution might have been spatio-temporal anamorphosis, which, rather than keeping the spatial dimension constant, with time as a variable, followed the exact opposite approach. The above example – with its numerous, superimposed “Corsicas” – calls animated movement to mind, as well as a new graphic solution – a series of juxtaposed “snapshot” maps termed the multiple static map (Monmonier, 1990, pp. 30-45). This cartographic innovation was clearly inspired by the recently introduced art of cinema (not surprisingly, Aldo Sestini, 1981 p. 170, termed these serial maps “cinematographic”). Cartography thus followed a trend similar to that seen in photography and painting at the beginning of the 20th century — disciplines that experimented with the simultaneous representation of the different positions of a moving body in space (e.g. A human body or a car). Isaiah Bowman’s map below (Map n°9) is an example of such a cartographic solution. Map n°9. Bowman I., “The Territorial Development of Bulgaria, 1878-1919”, in: The New World. Problems in Political Geography ,1928, p. 382. It is certainly not a coincidence that the temporal dimension attracted the attention of cartographers in a period (late 19th century – early 20th century) when speed took on an entirely new meaning. Cartography always reflects its time. The time of the geometrical map was thus described by Stefan Zweig (1964, p. 25): “It was an ordered world with definite classes and calm transitions, a world without haste. The rhythm of the new speed had not yet carried over from the machines, the automobile, the telephone, the radio, and the aeroplane, to mankind; time and age had another measure.” Once the change set in, cartography had to adapt. A large-scale revolution was set in motion in the mid 19th century, when two mathematicians (the Russian Lobacevskji and the German Riemann), independently conceived of the existence of non-Euclidean geometries. In geometry — the branch of mathematics most directly interested in the nature of space — multidimensional conceptions of space were gaining ground, in contrast to Euclid’s bidimensional geometry. It was physics, however, that later, with the theory of relativity, brought about the demolition of the conventional idea of space. By establishing the principle whereby bodies change their shape when they move with respect to a fixed reference system, Einstein disproved the Cartesian method, based on the orderly geometry of a system with fixed coordinates. What were the consequences of this extraordinary scientific discovery on the perception of the relationship between space and time? Previously, space had been an absolute, universal concept, treated by the modern scientific method as independent of time. Einstein’s revolution concerning relativity shook the conviction that a net distinction existed between time and space. The two now became indistinguishable, inseparable and interdependent. According to this view, space and time were, thus, interrelated, so much so that space could no longer be defined independently of the objects within it, or their mutual relations. The concept of motion thus changed again: no longer simply a physical change of place (as Newton would have seen it), nor a change in intensity (as the positivists would have conceived of it), but a change in reality as a whole, depending on one’s perspective. The centrality of perspective marks the transition from objectivism to subjectivism. The concept of chronotope, presented in 1908 by Hermann Minkowski, Einstein’s teacher in Zurich, is the ultimate graphic expression of the notion of flat spacetime conceived in the framework of Einstein’s theory of restricted relativity. It represents a single, organic space where the three traditional spatial dimensions (planimetric position, height and depth) are joined by another – time. Map no. 10 is a graphic application of Minkowski’s concept of chronotope to Napoleon’s Russian campaign, previously portrayed by way of a bidimensional map. Here, the cube’s base constitutes a traditional, bidimensional map, while the broken line inside the cube documents the event as it unfolds in time. Map n°10. Kraak M.-J., “A space-time cube of Napoleon’s march in Russia”, in: Geovisualization illustrated, Journal of Photogrammetry & Remote Sensing, 57, 2003, p. 397. The theory of relativity opened many new research paths for spatio-temporal representation. These were, however, slow to be pursued by scholars in the geographic and cartographic sciences. It was only in the 1960’s that Hägerstrand used time as a measure of human activity – based on a model that united time and space. Although a number of geographers followed in his footsteps4, the approach was nevertheless shortlived. The very same conceptual framework, however, inspired time-distance maps, a genre of anamorphic maps now very common, where Cartesian space is distorted as a function of time. The unwavering faith in technology and progress professed by positivism and – even more so – by scientism, generated a reaction aimed at rediscovering the human being. It was stated that observation could not be reduced to a mechanical operation, since it is inevitably conditioned by prejudice and scientific conviction. In this cultural context, destined to evolve into existentialism, the branch of philosophy most concerned with the concept of time and its redefinition was phenomenology. “One of the most important contributions of phenomenology to twentieth-century thought was its exploration of the way in which people actually experience time, in contrast to the way it is objectively divided into parts and precisely measured by clocks” (Kern, 1992). The philosopher most sensitive to the new concept of time was Henri Bergson, who developed a subjective and qualitative notion of time, diametrically opposed to that proposed by official science which — through standardization — deprived it of its essence. The adoption of a new concept of time was bound to stimulate new expressive sensibilities. The meaning of time was, thus, widely reconsidered in both art and science, cartography included. New maps appeared, bringing out an intimate, personal dimension. Map no. 11—an attempt to geographically retrace Napoleon’s entire life, from Ajaccio to Saint Helena—is an example of such a map. Map n°11. Horrabin J.F., “The Trail of Napoleon”, in: Wells H.G., The Outline of History Being a Plain History of Life and Mankind, New York, MacMillan, 1921, p. 912. As we have seen, geometric cartography, guided by Newtonian and Cartesian principles, presupposed a rational order that took precedence over spatial reality and was independent of it. But what if no predetermined rational order were imposed on spatial reality? Innovative experiments would emerge—and indeed did emerge. Representations, unable to rely on geometric cartography, were compelled to avail themselves of cartographic methods based on unorthodox epistemological principles. Just as the move away from figurative elements in the arts in this period marked the need to go beyond geometric abstraction, so too, for the first time in hundreds of years, a serious attempt had been made to break free of the mental cage of rationality imposed on spatial representations by a pre-existing geometrical order. Symbols and methods for the simultaneous representation of space and time. Several modes of representation of spatial phenomena in time have been presented above, documenting a continuous and probably not coincidental evolution, inasmuch as innovations paralleled developments in the philosophical interpretation of the concept of time. The few available systematic studies on the graphic representation of an action in space (Vasiliev, 1997: 17-34; Monmonier, 1990), have provided us with an important knowledge base for the study of this phenomenon, but have not tried to place it in the wider context of the history of thought. The present article, although certainly incomplete, makes its contribution by adding a number of graphic solutions previously not considered, and by identifying their possible intellectual roots. The chart below traces the advent of these graphic solutions chronologically (two symbols – the arrow and the unoriented curve; and five methods—the isochrone map, the spatio-temporal diagram, the multiple static map, the 3-D model and the anamorphic map), linking them to the dominant scientific paradigms in each period and to the intellectual needs that they were meant to satisfy. As the chart shows, old graphic solutions were gradually joined by new ones, which did not, however, substitute the former, but rather broaden the array of available possibilities. We can thus draw a first conclusion: each historical phase devises new, additional, cartographic solutions, not necessarily better than previous ones, but better able to serve the practical and intellectual needs of society as they arise. We should point out, however, that three of the methods identified (the isochrone map, the spatio-temporal diagram and the multiple static map) were introduced in the course of a very short historical period, at the end of the 19th century5. In these years, science equipped itself with very original methods for the graphic representation of spatio-temporal phenomena. Such a productive combination of scientific enterprise and openness to innovation was not coincidental. Clearly, the socio-cultural climate at the time, and the scientific paradigms then dominant proved particularly favourable. On the one hand, scientism, which regarded experimental sciences, with their innovative methodological approach, encouraged scholars to proceed with determination down the path of technical-scientific experimentation. On the other hand, a society at the height of transformation was acquainting itself with the first forms of modern visual communication. A constellation of unusually favourable conditions was thus created during the years in question — one that had never existed before and was never repeated later. Geographical maps are rooted in Cartesian thought. This inevitably limits their heuristic value, especially in their ability to capture movement. In the context of present-day reality, marked by a society in constant flux, these limitations render traditional geographical maps increasingly less satisfactory. On the basis of this premise, and aiming to explore alternatives to the rationalist approach and to Euclidean geometry, I shall present a review – not all encompassing, to be sure, but sufficiently extensive – of the different approaches to the rendition of movement in the history of graphic representation of space. Throughout the 19th Century, the search for solutions in the joint representation of space and time remained bound to positivistic standards. In the early 20th Century, Einstein’s theory of relativity and the notion of space-time shook the previously held Newtonian concept of absolute space, triggering a reflection concerning the gap between the conventional definition of space, based strictly on what is visible, and a broader interpretation of human experience. This resulted in concrete attempts at introducing new representative modalities for the space-time relationship, not limited to what is seen by the human eye. The scope of these transformations was such that, transcending science, a new perception of time and space swept society, finding expression in the work of avant-garde artists and writers. The personal dimension found its way into geographical representations, drawing them somewhat closer to the medieval notion of symbolic space, an idea that Renaissance cartography had eradicated, and replaced with a mathematical, logical concept of space. These highly innovative space-time representations were therefore forms of reaction to the positivistic outlook, reclaiming an autonomous space for man and for the creative human spirit that rises above the narrow limits of positive science. A number of original approaches to the problem of the graphic representation of the space-time relationship thus emerged. These were isolated attempts, often lacking a body of established rules and standards, and inevitably foreign to the evolution of official cartography, but nevertheless worthy of reconsideration at the present time, in which the rationalist model of cartography finds itself in crisis.